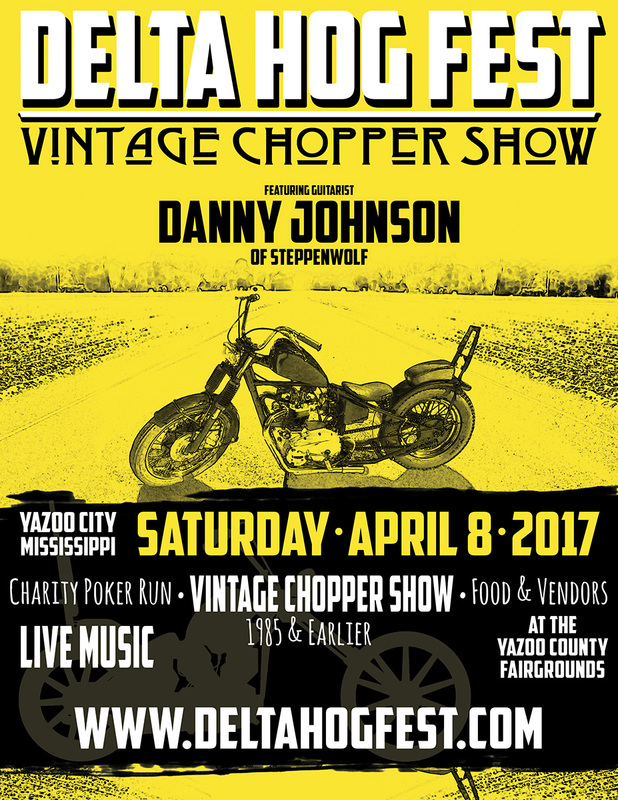 Delta Hog Fest Vintage Chopper Show Vintage Choppers, Charity Poker Run, People’s Choice, Music and MORE in the Yazoo-Mississippi Delta. Saturday, April 8, 2017 Yazoo County Fairgrounds 203 Hugh McGraw Drive Yazoo City, MS 39194 Live Music Featuring guitarist Danny Johnson of Steppenwolf! Charity Poker Run (Sign-up at 9AM) People’s Choice Award Vintage Chopper Show (1985 & Earlier, invited) Food & Beverage Vendors Merchandise Vendors Music starting at Noon AND Generally, more fun than you can shake a tail pipe at! Admission is $25 at the gate ONLY! LIVE music starts at NOON! NO COOLERS NO PETS BRING your I.D and Lawn Chairs or Blankets Entertainment Schedule: Burlap Rebellion (Belzoni, MS) “Bluesman” McKenny Williams (Jackson, MS) Bill Abel (Duncan, MS) Guitarist Danny Johnson of Steppenwolf – 2 SETS!! Stay tuned for updates on the web at www.deltahogfest.com and on Facebook, Twitter, and Instagram from Delta Hog Fest!